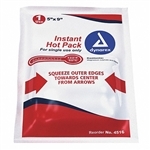 Single-use instant heat pack offers a convenient and cost-effective method of delivering localized heat therapy for muscle aches and strains. Especially useful for children, or on special parts of the body, such as hands, feet, shoulders, elbows or knees. Because of its large size, the Standard can be applied to larger areas of the body, including the entire spine, both shoulders, and the legs.